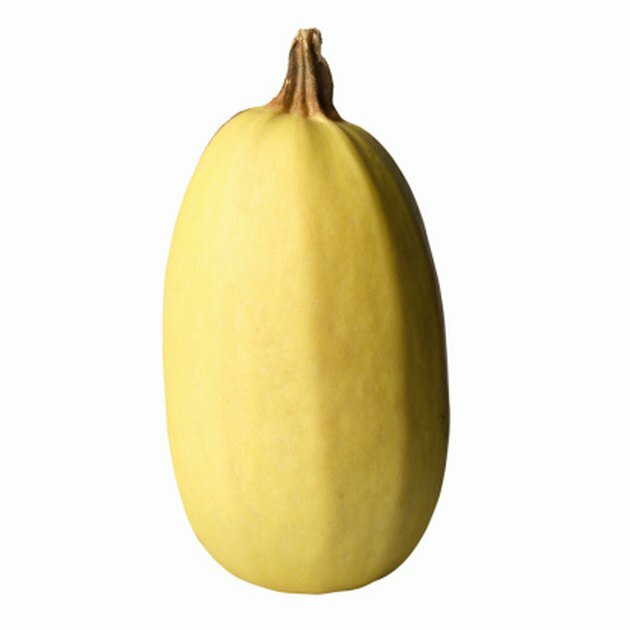 Spaghetti squash, one of the common and popular winter squash varieties, grows into a large oval squash with a yellow or orange skin. Most spaghetti squash varieties mature in three to four months. If you lack garden space, grow a vine variety of spaghetti squash on a trellis to conserve soil area. Because the spaghetti squash become quite large as they mature, rig a support system for the growing squash. The winter spaghetti squash grows readily up a trellis. Prepare a sunny growing location after the final spring frost. Cultivate the soil with the garden spade down to a depth of 6 to 8 inches. Add 4 inches of compost to the top of the soil and work the compost and the soil completely to mix them. Rake the soil surface smooth. Insert the wood or metal trellis system into the soil. Pound the bottom of the trellis into the soil with a hammer to drive it at least 8 inches into the ground. Plant the spaghetti squash seeds along both sides of the trellis, positioning the seeds four to six inches from the trellis. Sow two seeds together about 1 inch deep, spacing the seeds about 12 inches apart. Cover the seeds lightly with soil. Water the seeds generously immediately after planting and keep the soil moist while the seeds germinate – about one to two weeks. Provide water for the growing spaghetti squash plants if less than 1 inch of rain falls in a one-week period. Thin the seedlings when they reach a height of 4 inches. Remove the weakest seedlings to leave one plant growing every 12 inches along the trellis. Apply the fertilizer to the seedlings by sprinkling 1/4 lb. of granular fertilizer for every 10 feet of seedlings. Apply the fertilizer approximately three weeks after you see the first blossoms and work the fertilizer into the soil well with a hand rake. Pull weeds as they appear, to keep the soil area free of competing plants. Tie the vines to the trellis with the stretchy plant ties to train the vines. Support the main vines by tying them loosely to the trellis. Cut a 2-foot length of cheesecloth for each spaghetti squash that begins to grow on the plants. Tie the cheesecloth so it acts as a sling for the squash and tie the ends of the cheesecloth to the trellis. Harvest spaghetti squash before the first autumn frost, when the skins turn yellow. The skin should feel firm to the touch. Use a sharp knife to cut the squash from the vines, leaving about 3 inches of vine protruding from the squashes.